FloPlus™ cartridges utilize a revolutionary new technology that significantly enhances the traditional Fibredyne® product, making it possible to obtain cyst reduction in a cartridge that functions like a nominal 10-micron cartridge. This Pentek FloPlus-20 carbon block filter cartridge reduces fine sediment, chlorine taste and odor, and protozoan cysts in residential drinking water. It has a nominal (85%) filtration rating of 0.5 micron, and 99.95% efficiency for the reduction of protozoan cysts. It will reduce free available chlorine (FAC) at 2 parts per million (ppm) by at least 90% in up to 20,000 gallons at a flow rate of 2 gallons per minute (gpm). This cartridge is made of modified bonded powdered activated carbon (PAC) filter media that provides efficient cyst reduction with a flow rate and dirt-holding capacity comparable to those of a 10-micron filter. The Santoprene (TPE, thermoplastic elastomer) gaskets seal the cartridge against the housing (sold separately). The cartridge has an initial pressure drop of 2 pounds per square inch (psi) at a flow rate of 2 gallons per minute (gpm), and operates over a temperature range of 40 to 180 degrees F (4.4 to 82.2 degrees C). 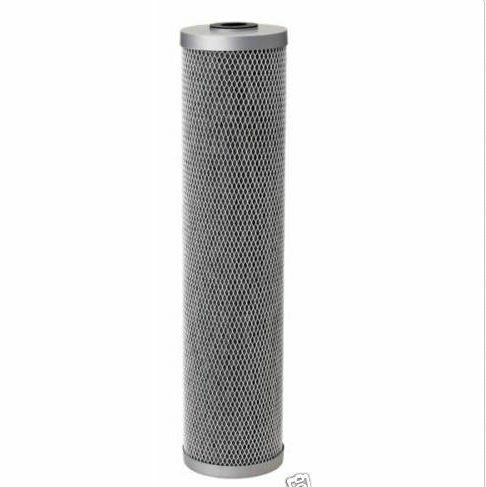 This carbon block filter cartridge meets National Sanitation Foundation/American National Standards Institute (NSF/ANSI) standard 53 for quality assurance, and is used for purification of residential and commercial drinking water. The nominal filtration rating is for a particle removal efficiency of 85%. Protozoan cysts include Giardia, Entamoeba, Cryptosporidium, and Toxoplasma. Chlorine reduction capacity is the minimum total amount of water for which the free available chlorine (FAC) at a concentration of 2 ppm is reduced by at least 90%.